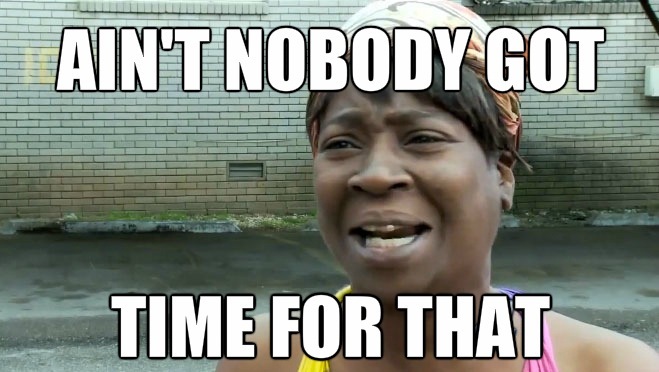 Google search “does calorie counting work?” and you’ll be inundated with about 1,150,000 results in 0.24 seconds. And considering all you want to do is answer your original question, “does calorie counting work?” it’s easy to get frustrated, confused, discouraged, and fed up with the fitness industry all at the exact same time. The worst part is none of the articles use practical, real life examples. They all claim to understand the science and physiology regarding how calories affect your body, and they revel at the opportunity to use big words like nutrient partitioning and hormonal optimization (even though they hardly understand what they mean and mainly use them to impress you). Understanding the science and current research is obviously of the utmost importance (and I’ll explain it later in this article) but nothing beats real world results. Think about it: a study like this one might conclude, “green tea extract can increase fat oxidation…” but how many real people with 6-packs do you know who stand by green tea as their ultimate fat burning secret? And that’s why practical, real world results are so important. Research can help us look at things under a certain lens, but that lens changes when you’re leading a normal life outside of an isolated lab. I’m excited to introduce you to my online coaching client, Lisa. Lisa lives in Canada, is an award winning equestrian with her horse Riggs, and she’s worked closely with me in my 1-on-1 online training and nutrition coaching program for the past 2-years. 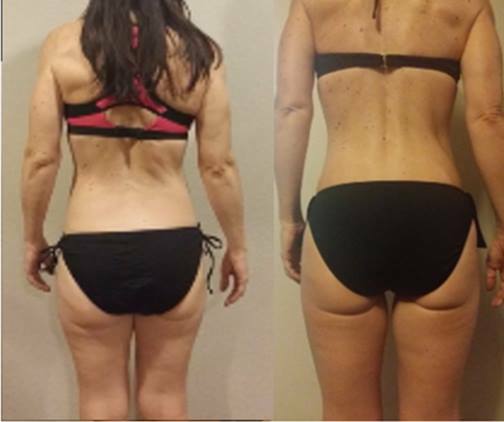 In that time frame Lisa has lost over 30lbs of fat and gained approximately 10-15lbs of lean muscle. How’d Lisa build a body worthy of a magazine cover? Specifically, she’s continuously tracked her calorie and protein intake over the past 2 years and…well…I think it’s pretty obvious that calorie counting clearly worked for her. But that’s just one example. Maybe she was a fluke? I mean, we can’t answer the question, “does calorie counting work?” based on a single success story, right? Allow me to introduce you to another one of my all-star online coaching clients, Carly. An extraordinary young woman born and raised just outside of Boston, Carly is one of those people who you just can’t help but admire. Incredibly smart and exceptionally kind, Carly originally started working with me to help her lose weight in preparation for a weightlifting competition and eventually stayed on as a client to work on maintaining a lean physique year round. How’d Carly lose about 20lbs and get a truly insane set of abs? Just like Lisa, Carly kept track of her calorie and protein intake on a daily basis to make sure she stayed within the guidelines we both agreed upon. I’m not sure about you but I’d say calorie counting worked for Carly as well. But, then again, it’s a pretty small sample size; maybe that’s just two outlandish incidences? I’m happy to introduce you to my online coaching client, Erin. Erin’s another sweet, young woman based out of New England who just so happened to get engaged recently and I couldn’t possibly be more excited for her! Erin and I have been working together in my online coaching program for about 6-months now and she originally came to me with the hopes of leaning out for wedding season while working around her insanely busy work/travel schedule. 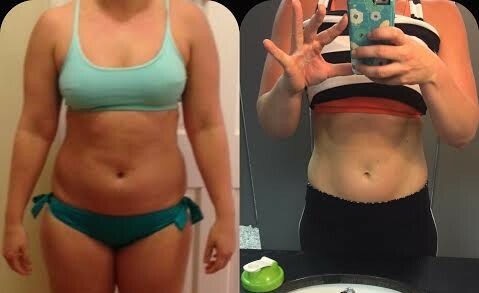 How did Erin lose about 20lbs of fat and gain roughly 8lbs of muscle? Yup. Just like Lisa and Carly, Erin has been tracking her calorie and protein intake with extraordinary success over the past 6-months and we’re currently working on transferring her into maintenance. But, hold on, there’s thousands of articles saying calorie counting is bad for you. So it can’t work, right? These have to be outliers, don’t they? Give a warm welcome to my long-term online coaching client, Chris. Chris is one of the funniest guys I’ve ever met. Aside from being a real life dare devil (seriously, in his free time he rides Moto-X dirt bikes as fast as he possibly can) he’s also got the goofiest sense of humor and most endearing charm about him. 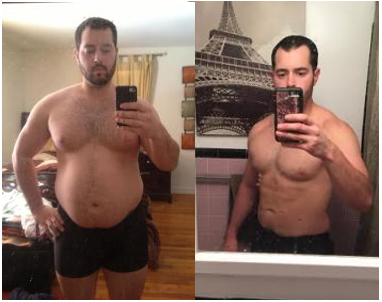 A member of my online training and nutrition coaching program since 2014, Chris came to me as a last ditch effort. He had tried every diet, cleanse, and meal plan out there but, no matter what he did, he couldn’t shed the fat. 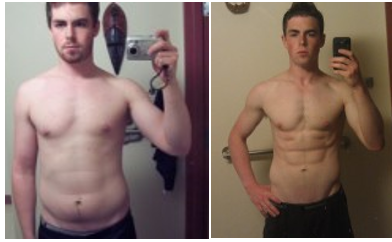 So how did Chris end up burning pounds upon pounds of fat and building loads of lean muscle? Tracking his calorie and protein intake just like everyone above, Chris finally found the best program that allowed him to enjoy life while staying shredded year round. 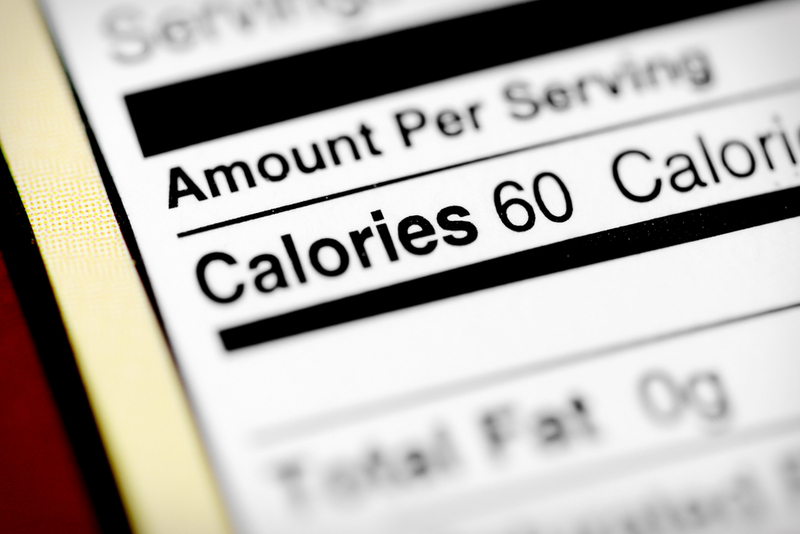 Still not so sure about this whole calorie counting thing? Does calorie counting work? Say hello to my lovely online coaching client, Kelly. A wonderful woman currently based out of Wisconsin, Kelly is a role model wife, mother, and friend. 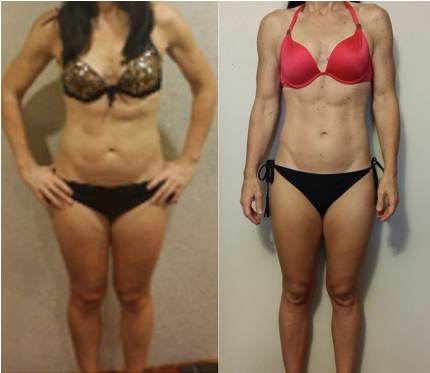 Simultaneously one of the most kind and caring ladies I’ve ever had the pleasure of working with, Kelly has been a member in my online training and nutrition program for the better part of the last year and never ceases to amaze me with her effort, dedication, and limitless hard work. Not only has Kelly completely transformed her outlook on food, but she continues to make huge strides in her physique as you can see from her abdominal progress above and glute progress to the left. 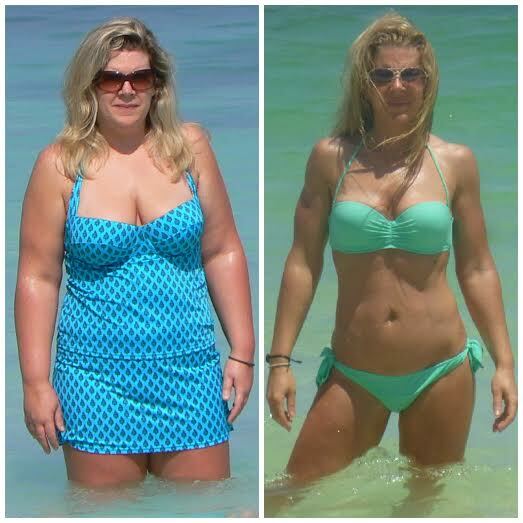 How did Kelly completely transform her physique? Yup, Kelly counted calories just like another of my online coaching clients, Jerry. Not a day goes by where Jerry doesn’t send an e-mail that makes me legitimately crack up, hysterically laughing out loud. And considering he’s holding chips & beer in his “before” picture and wearing his fire department helmet in his current progress picture, I’m sure you can get a sense of Jerry’s world class sense of humor. But Jerry isn’t just a comedian; he’s also an insanely hard worker. 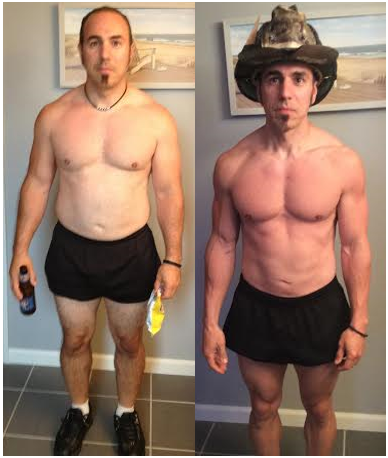 Over the past year Jerry has lost over 40lbs of fat, gained over 10lbs of lean muscle, and transformed himself into the most dashing fireman in the north east (possibly even the entire nation). How did Jerry do it? This is getting crazy, I know. With low-carb zealots, paleo dogmatists, and vegan fanatics claiming “calories don’t matter as long as you eat ABC and not XYZ” it’s crazy to see all of these incredible, real life success stories from simply counting calories. The reality is calorie counting works. I’ll explain why a little bit later but, for now, suffice to say calorie counting works for weight loss and fat loss. 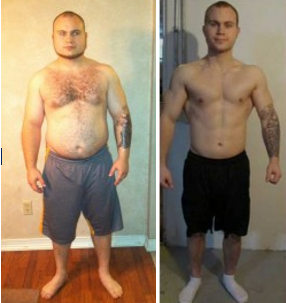 Hell, my client Kyle dropped 54lbs without counting a single calorie. 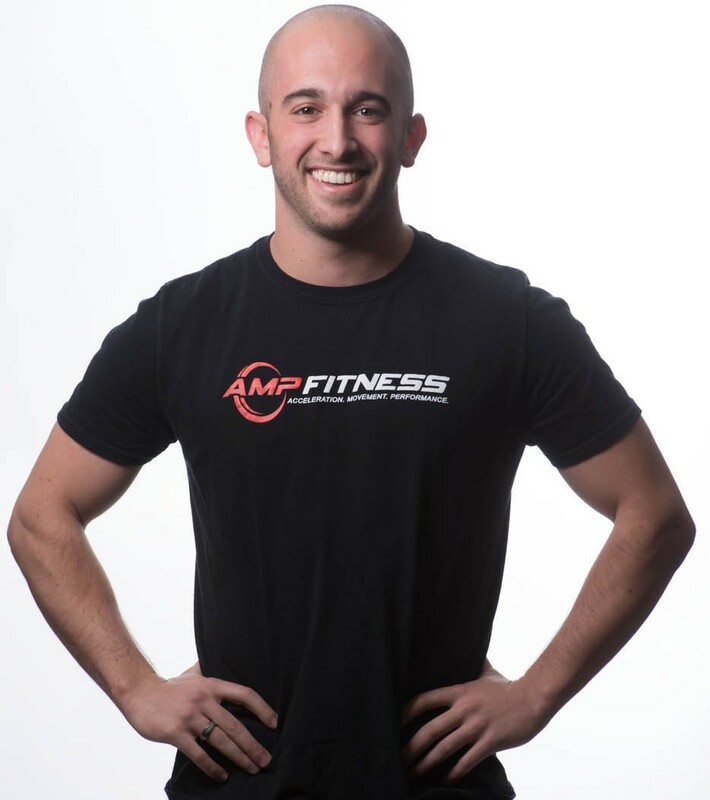 How did Kyle burn over 50lbs of fat while simultaneously gaining slabs of muscle and amplifying his strength without counting calories? 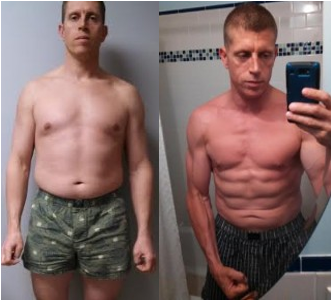 Simple: we strategically monitored his portion control to make sure he was eating enough to gain muscle but not too much to keep him from burning fat. Granted, monitoring portion control is another way of reducing calorie intake. The only difference is he didn’t physically weigh, measure, count, and track his calories. Rather, he just stuck to the portion control guidelines which was guaranteed to reduce his calorie intake. 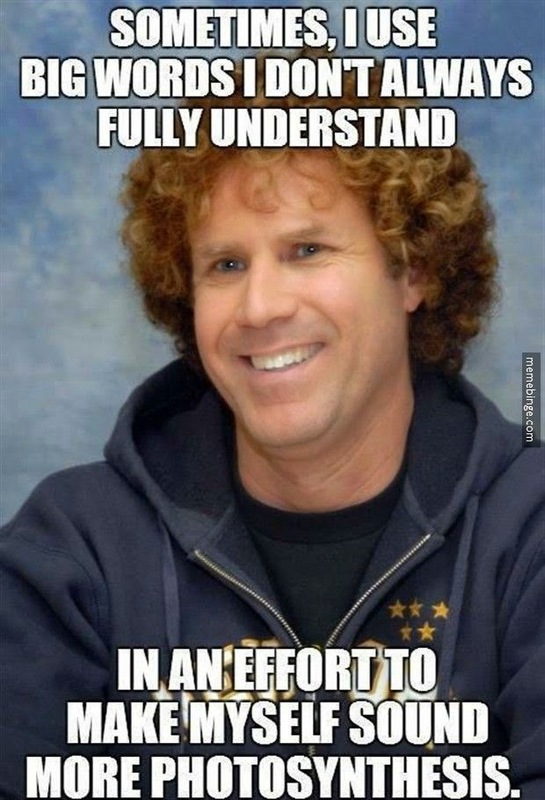 That’s pretty much the same strategy I used with my online coaching client, Adam. And, well, Adam clearly got shredded to bits without counting a single calorie. Same goes for my online coaching client, Rich, who lost nearly 100lbs without ever tracking a calorie. 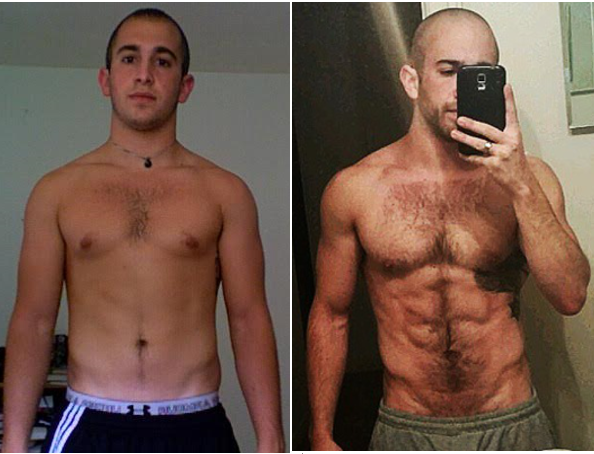 Instead, both Adam and Rich just adhered to the general portion control guidelines I laid out for them and, voila, they both completely transformed their lives and physiques. So is calorie counting necessary to burn fat? No. You can burn fat without counting calories. Yes. Yes, It does. And now I’ll explain why. Why Does Calorie Counting Work? Rather than spitfire a quick list of reasons why calorie counting works, in this section I’m going to walk you through the most common arguments against calorie counting and break down the truth. The most commonly touted argument against calorie counting, many nutrition coaches will tell you “all calories are not created equal,” basically insinuating calories from different foods are inherently different from one another. To say that calories in a donut are different than calories in an apple is akin to saying inches on a ruler are different than inches on measuring tape. An apple is far more nutritious than a donut. No one in their right mind would try to argue otherwise. But calories and nutrients are two entirely separate entities. A Calorie is a unit of heat we use to measure how much energy a given food provides your body. All food has calories and the amount of calories in a given food is dictated by it’s macronutrient composition. A Nutrient is a substance that provides nourishment in the form protein, carbohydrates, fats, vitamins, minerals and/or water. A calorie is a unit of energy. That’s it. 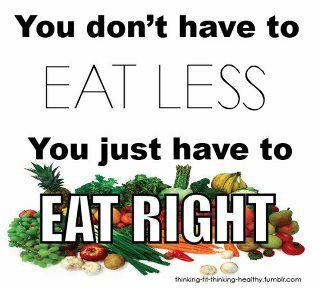 It doesn’t nourish your body (that’s what nutrients do). All it does is provide your body with energy. So while an apple has 80 calories and a donut has 300, the difference in those calories lies solely in the total amount – NOT the composition of each calorie. 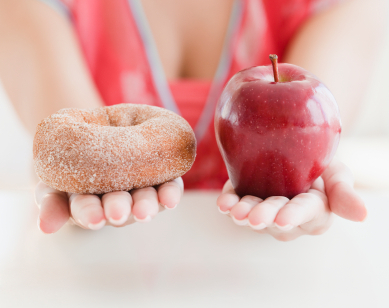 Put differently, the calories in an apple are the same as the calories in a donut. The only difference is the donut has more. Nutrients, on the other hand, aid in nourishing your body with proteins, carbs, and fats along with a variety of vitamins and minerals. Of particular importance, each nutrient (and subset of each nutrient) is different from one another and causes unique reactions within your body. Protein, for example, has less calories than fat and is very good at being used to build and maintain muscle mass. Fat, however, is easily stored and functions as a phenomenal source of energy during long duration, low intensity exercise. 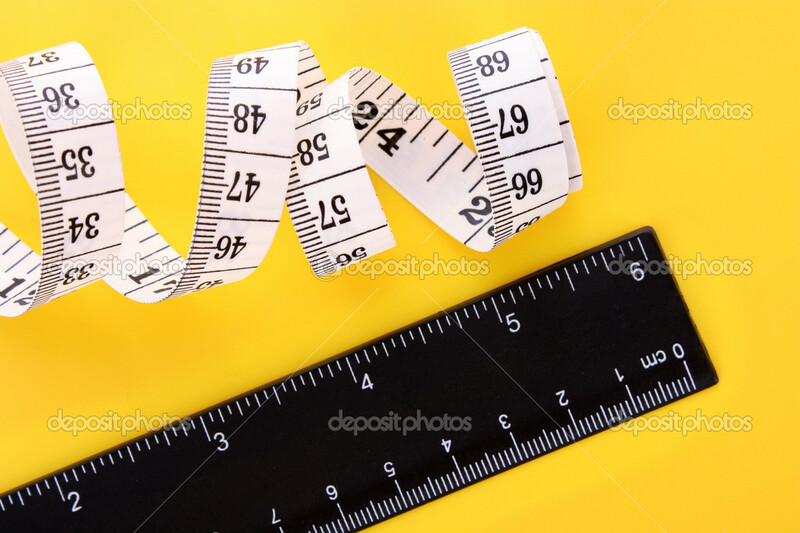 To that end, just as inches on a ruler are the same length as inches on measuring tape, calories from a donut will be processed exactly the same as calories from an apple. The nutrients, however, will be processed uniquely from one another as they are all innately different. All calories are created equal. A calorie is a calorie just as an inch as inch. Calories are units of measurement – a static measure – that do not change in composition regardless of the food they’re in. Nutrients are inherently different from one another, dynamic in nature, and are processed, absorbed, and digested differently based on countless individual factors. As a result, different foods with varying nutrient densities affect your body uniquely. Which begs the question, what’s more important for fat loss: calories or nutrients? Another of the most common arguments against calorie counting, many nutrition coaches will tell you calories don’t matter so long as you eat “clean” or “healthy” foods. And while eating a “healthy” diet is obviously important for countless reasons, there are a couple major issues with this train of thought. Some people define “clean” foods as organic while others consider them to be vegetarian. Some think “healthy” means low carb whereas others believe it to be unprocessed. Some think Paleo is the truest form of “clean eating” while others believe a low fat diet is the healthiest. So who is right? Which diet is “healthy” or “clean” and which diets aren’t? There’s no such thing as a single “healthy” diet. Whatever constitutes “healthy” depends on a variety of factors regarding your individual tolerances, preferences, needs and goals. To that end, there is no “right” way to eat. Of course you should emphasize whole, minimally processed foods, eat lot’s of fruits and veggies, and fuel yourself with a variety of proteins, carbs, and fats…but claiming there is a single “right” way to eat is severely short sighted. In essence, these coaches claim certain foods (i.e. apples) have good calories while other foods (i.e. donuts) have bad calories. And, so long as you eat foods with good calories, you don’t need to worry about how much you’re eating because “good calories” can’t make you fat. You already know that calories are calories (they’re a unit of measure for cryin’ out loud) and saying some are “good” and others are “bad” is akin to saying 1lb of bricks is heavier than 1lb of feathers – it sounds logical but, once you give it some thought, it’s obviously not true. 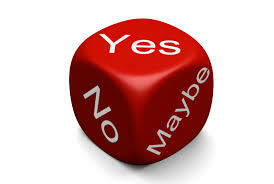 On the same token, all foods have calories and, regardless of how “healthy” the food may seem, calories always count. One of the most nutrient rich foods in the entire world, avocado is very calorie dense and exceptionally easy to overeat. While some nutrition coaches say you can have as much avocado as you want because it’s “clean,” the truth is too much avocado (and subsequently too many calories) will make you gain weight. Keep in mind, avocado has countless health benefits and completely abstaining from it is not the answer. Rather, understanding how to eat avocado (and all foods) using appropriate portions is the key to fat loss and long-term success. If you want to burn fat you need to eat less calories. Regardless of how nutrient-rich your food is, you need to come up with a strategy that allows you to eat less calories than your body needs to maintain its current weight. I can’t help but find this argument comical. Who cares if they’re slightly off? As you saw with my clients, calorie counting works and it works really well. And if calorie counting can give you a better understanding of how much you’re eating and subsequently improve portion control…who cares if the labels are slightly inaccurate? Using their logic, you should never use a clock because most of them are slightly off and you never known which ones are truly accurate. 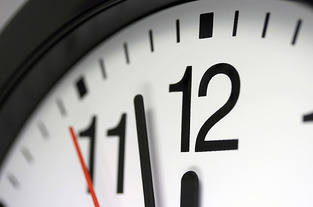 Obviously you know that’s ridiculous because, even if the clock isn’t exactly right, from checking it you gain a general understanding of what time it is, how much time you have, and how much time you need. Counting calories works the same way. While you may not know exactly how many calories are in a given food, you gain a much better understanding of how much you’re eating, how many calories you have left, and how many calories you need. Yet another common myth perpetuated by those who claim calorie counting doesn’t work, saying calorie counting is “socially restrictive” is a quick and easy way to scare people away from trying it. But is calorie counting really socially restrictive? Take anything to an unreasonable extreme and it will become socially restrictive. 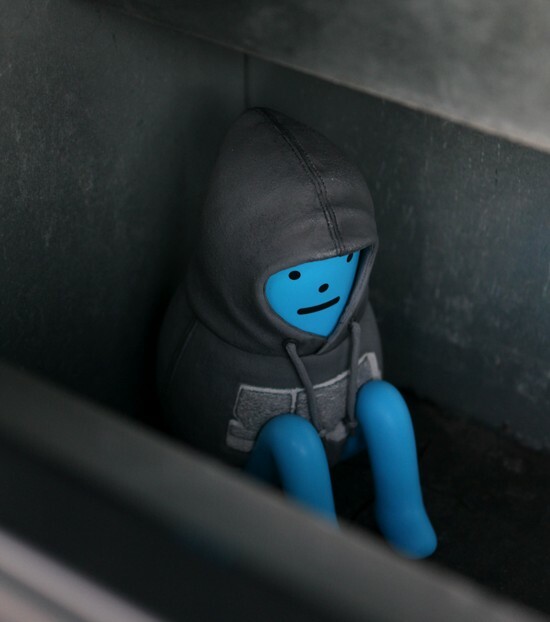 It doesn’t matter if you meticulously count your calories, are obsessed with running, are constantly playing World of War Craft, or are simply a workaholic. Anything taken to an extreme is socially restrictive. 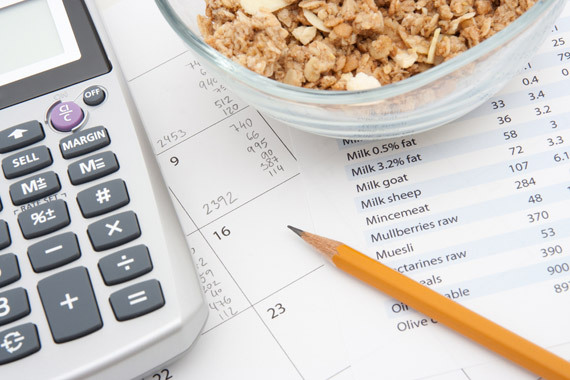 The truth of the matter is, done properly, counting calories is not socially restrictive as long as you have a flexible mindset and understand simple strategies to help you stay on track. For example, in this short video I describe how to eat out at parties and social events without blowing all of your hard earned progress. Hint: the answer is not what you think. Of course, countless technological advances make calorie counting incredibly easy, so all of my clients utilize a variety of online tools and applications to make sure calorie counting isn’t socially restrictive in the least. As of right now, Fudist is the fan favorite for all of my clients. Going out to eat at restaurants while counting calories used to be a bit of a hassle, mostly because it was difficult to know with a reasonable level of certainty how many calories you were eating. Obviously this made calorie counting a little more challenging and some people felt like it was socially restrictive. But with new tools like Fudist, eating out at restaurants while counting calories couldn’t be any less socially restrictive. Before Fudist, you’d have to go on the internet and scroll through hundreds of menu items while searching for the ideal calorie/protein ratio to see what meals were your best bet. 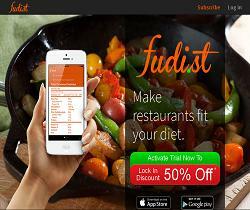 Now Fudist takes care of that and automatically finds every meal combination at every restaurant near you. The best part is Fudist has zero learning curve, it takes less than 60-seconds to use, and nobody around you knows you’re counting calories (i.e. not socially restrictive at all). All you need to do is bust out your phone, plug in how many calories you want to eat, and it will immediately show you every possible meal combination at countless restaurants near you. Another common calorie counting myth, many nutrition coaches like to say, “calorie counting doesn’t work in the long-term,” because it’s not a maintainable strategy for the rest of your life. She’s been counting calories for 2-years and, considering most people can’t stay on a diet for 30-days never mind 2-years, it’s pretty obvious that calorie counting has helped Lisa succeed in the long-term. But the benefits of calorie counting aren’t solely restricted to those who count calories for the rest of their life. I spent just over 1-year weighing, measuring, and tracking my calories. From that point on, I haven’t tracked a single calorie but I’ve continued to stay lean, build muscle, and improve my physique. Because the skills and knowledge I gained from calorie counting helped me understand exactly how much I needed to eat in order to burn fat, build muscle, and stay lean year round. In other words, even though I don’t actively calorie count I still use the skills and knowledge I learned from calorie counting and that is what has made my diet sustainable in the long-term. Wrapping Up: Does Calorie Counting Work? And don’t let anyone convince you otherwise. It isn’t the only way to do things and it isn’t the best choice for everyone, but there is no denying that calorie counting is one of the simplest and most effective ways to burn fat, build muscle, and help you create the body you’ve always wanted.